MyNSARecords.com to Conclude Mailing -- THANK YOU!! Together, we have made quite a statement. 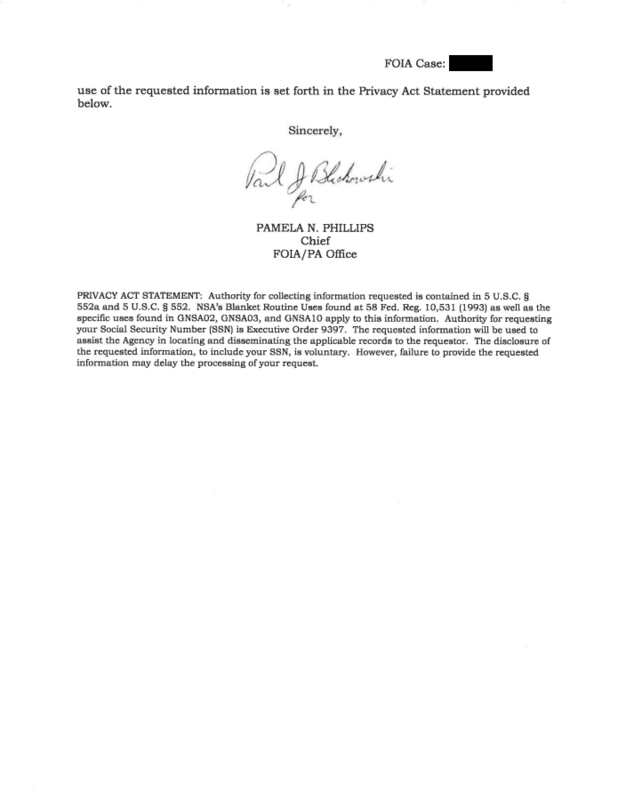 MyNSARecords.com users have now mailed 1,341 Freedom of Information Act requests and 197 Motions to Quash. Judging by the fact that these requests are being assigned case numebrs in the 70,000-range, this means that about 2% of the FOIA requets the NSA has ever received in their 60 year history have been through MyNSARecords.com. This is awesome. 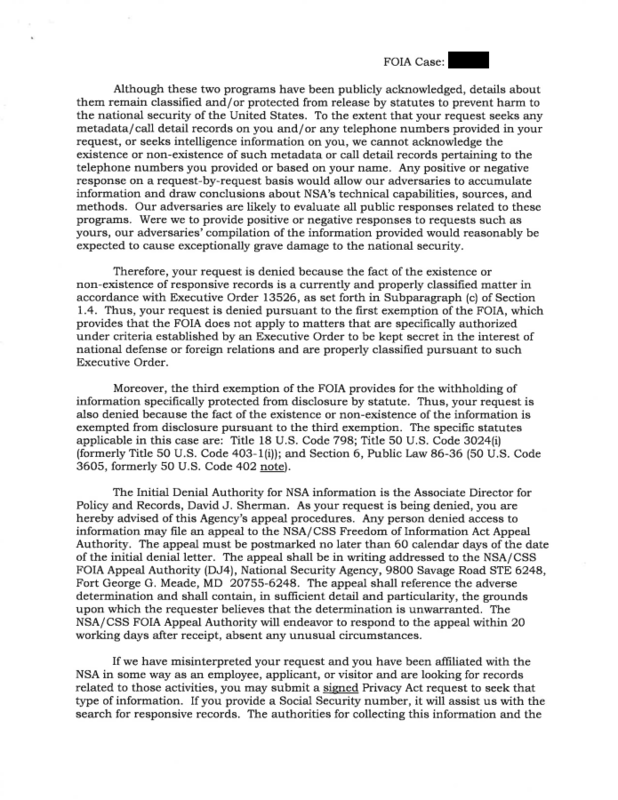 As expected, the NSA has begun denying FOIA requests (Denial Letter, page 1, page 2, page 3). Seemingly fluent in Newspeak, the letter essentially says that they are authorized to collect your information, but admitting to having your information would allow our enemies to know that they have your information. 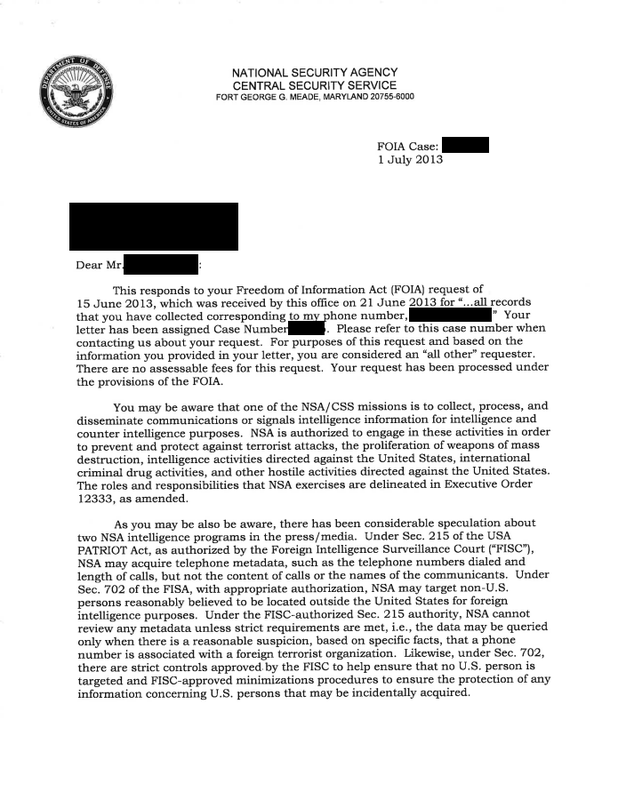 I do hope that all of you who receive rejection letters appeal the denial and, if necessary, take the NSA to court. Their denial reason does not hold up to basic logic, and I think that in light of their public admissions regarding the existence of the spying programs, they will have a very difficult time persuading a federal judge that releasing your records is the release of some kind of national secret. I will be posting an appeal form shortly (a FOIA "appeal" is a second letter to the agency giving them a final chance to release the documents before suing them) on the front page of the Web site. With that said and with this incredible success, MyNSARecords.com will conclude its mailing service such that I may return to focusing on the civil rights issues that I was working on before this scandal broke (namely, TSA abuse and NYPD stop-and-frisk). I encourge you to continue to submit FOIA requests, Motions to Quash, etc., regardless of whether the government wants to deny them, and will continue to post the forms to do so indefinitely on the front page as well. We processed our 1,000th request for a copy of (or the deletion of) NSA records today, just 2 weeks after our initial launch. We still have a few hundred more requests pending to send, and we're happy to accept new requests as well. Keep them coming and spread the word! I authenticated the sender by looking up the IP address from which it came, which was registered to MD Procurement Office, Ft. Meade, MD. Sounds about right. It seems that the NSA does not quite get that this is a protest, in addition to a request for information. :) I'll leave it up to you guys: if you'd like to indulge the NSA, submit your requests online. If you enjoy the protest, please continue to use (and share!) the site and I'll continue to deliver your paperwork. The NSA FOIA Office received a box of FOIA requests from you today. to submit requests to us; however, it is not a very efficient way to do this. individuals will not know why. We do answer each and every request that we receive. assurance that the information is complete. Thank you. If you have any questions, feel free to contact me directly. If your FOIA requests were in the first batch that we sent out on Sunday, they are now sitting on the desk of a confused and annoyed NSA employee in Ft. Meade. Also, if you were in the first batch of motions to quash, your motions are currently in transit to the desk of a soon-to-be confused and annoyed attorney with the Department of Justice. If your request was sent and you left a valid e-mail address, you will receive an e-mail by tomorrow confirming this. I'll be mailing the next batch this weekend (almost 500 more, so far!). So what's next? First, I have to clarify that since I'm not an attorney, I can't give you "legal advice." Printing and mailing forms that you've filled out isn't legal advice, and publishing a form has been ruled to be protectect speech by pretty much every appellate court to consider the issue. See, for example, Dacey v. New York County Lawyers' Assn, 234 N.E.2d 694. The line is typically drawn at preparing an individualized pleading for a specific person's situation, or advice relating thereto. So, if you ask me a question about what to do now by e-mail, I probably can't answer. With that said, as a general matter, FOIA requests can either be responded to or ignored. If the request is ignored, or responded to by refusing to provide documents, one can sue in their local U.S. District Court to compel the production of those documents. I'd be willing to bet that for such an issue, there will be attorneys who would take your case pro bono (if you're such an attorney, please contact me with the federal courts in which you are admitted and I'll put you in touch with people as the time comes). If you win your suit, you may be entitled to attorney's fees (assuming you paid an attorney). If you decide to sue and need proof of mailing, please contact me. Also as a general matter, and based on my readings of the FISA court's rules, the first step is to see if your motion will be accepted. They might require a hand signature or other nuance. If so, I would simply do what they ask and re-send. If you need an electronic copy of the document you've sent through this site, please contact me. Once accepted, your motion will be responded to by the government, and you may respond to that. Please see all of the court's rules if you plan to follow through on your motion. If your motion is ultimately denied, you may appeal to a FISA review court and then to the U.S. Supreme Court. You will probably wish to have an attorney help you with this. In short, if the government doesn't accept your document right away (and they probably will try to find every reason not to), don't give up! Press the issue! I've filed documents in U.S. District Courts, U.S. Courts of Appeals, and the U.S. Supreme Court, as well as various state courts. It's generally a fairly simple process: each court has a clerk, and you simply need to get them the documents and, sometimes, pay a fee. Some have silly procedures (for example, the U.S. Supreme Court politely asks you to place all your documents in a garbage bag), but nothing terribly difficult, per se. So you can imagine my surprise when I was at the post office on Sunday with your Motions to Quash in an envelope, and could not find the address to send them to. That's because no such address exists. As I stood dumbfounded with my smartphone in the iconic James A. Farley Post Office in Manhattan, I learned that there is no address for the clerk of the FISA court. FISA Ct. Rule 7(k) states that, "A party may obtain instructions for making submissions permitted under the Act and these Rules by contacting the Clerk at (202) 357-6250." So that I did, and of course, it just gets weirder. I left a message, which was returned yesterday by a pleasant sounding woman who told me to reach a woman named Christine Gunning. I asked if this woman was a representative of the clerk, and I was told, "No." Well then who is she? "She works for the Department of Justice." The idea that there is a court in the United States of America that has not even a mailing address is absolutely astounding. But upon further research, "the FISC" appears not to actually exist, at least as a physical court room. The idea that in order to reach the judicial branch, I must ask the executive branch to process my request is antithetical to the separation of powers required by our constitution. But, this whole deal -- the spying, the secret courts, the lying to us to "protect us" -- it's all antithetical to our values, isn't it? I will continue to work to get your motions submitted. After a long night of pondering and coding, My NSA Records went online last Friday morning at about 7:00 AM ET. In the first 24 hours, we received over 500 form submissions for FOIA requests and motions to quash! The first 500 FOIA requests were printed and mailed yesterday, USPS tracking # 7012 3460 0001 8135 6494. This certified mail package is on its way to Fort Meade in Maryland (yes, a military base -- did you know that the NSA is actually an arm of the U.S. military?). What an epic response. Thank you for helping us to engage in our own form of protest: letting the NSA and FISA Court know that the people are watching and are unhappy with what they see. Whether or not they stonewall our requests, they are getting a taste of something they never expected: accountability for their actions. And thank you to those who donated and helped pay for the printing and mailing costs so that this site can continue to offer its services for free! We've also made a few improvements to our site: a new logo donated by graphic designer Andrea Brannon, our forms now use HTTPS for secure transfer of your data, and we now accept donations in Bitcoin (in addition to PayPal). Please continue to share My NSA Records -- if you have a Facebook, Twitter, Reddit, or other social sharing tool, spreading the word helps keep this effort going! Even if "only a few people" are connected to you, your help is much appreciated! Copyright © 2013 Jonathan Corbett. All rights reserved.